Think Maths is a team of experienced mathematics speakers who visit schools to run workshops and give talks for a wide range of ages and abilities. Our sessions are interactive, engaging and cover mathematical content which will grab the attention of students and inspire them to get excited about maths. 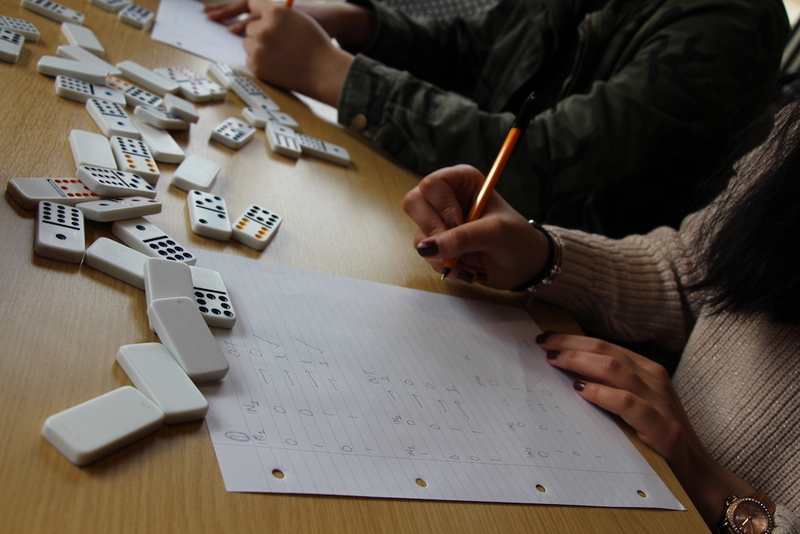 We show students the wider world of maths beyond school while giving them a chance to develop invaluable mathematical thinking skills. Our aim is to inspire students to be more motivated in normal lessons. All the groups enjoyed the talk and activities, even sharing some of the ideas with other students in the following days. It created a buzz for maths around the school! Think Maths was set up by Matt Parker, the Stand-Up Mathematician. As a former teacher Matt started Think Maths to go into schools and deliver engaging talks. Matt now talks about maths in the media, is a YouTuber, maths author and the Public Engagement in Maths Fellow at Queen Mary University of London. Matt is joined by Katie and Zoe (featured right with Matt), who work on all aspects of Think Maths; including presenting workshops and talks and creating resources for teachers, and by Sarah, who manages the logistical aspects of the programme. Matt, Katie and Zoe can be booked by your school to deliver workshops or talks. Friend of Think Maths, author and  speaker  Rob  Eastaway can also be booked to visit your school. The Think Maths presenters come from a variety of professional backgrounds; Katie has a PhD in Mathematics and  Matt  and Zoe are former teachers. Rob  is a maths author-turned-speaker. They love delivering sessions on all areas of maths and specialise in talking to large audiences and running engaging workshops. They are based around the country, and each have their own delivery style and in some cases their own talks to give. Turn a digital photo into an Excel spreadsheet!